In the tenth issue of the Bed and Breakfast Traveller, we visit the Haliburton Highlands (http://www.county.haliburton.on.ca). 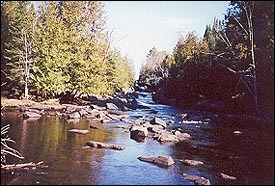 The county is bordered on the north edge by Algonquin Park and on the south by, roughly, Moore Falls to the west and Silent Lake Provincial Park to the east. Fall is an ideal time to visit. All across the rolling hills the trees are beginning to tease us with little flames of crimson and pink, with flashes of gold and copper that will peak in a brilliant crescendo. Inevitably, a drive anywhere in the Highlands takes you through great rocky and forested expanses of pine, spruce, maple, oak, and balsam trees. 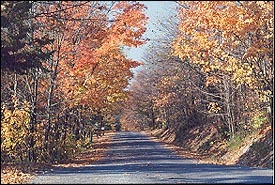 But for a more intimate view, try the little backroads that wind up and down amid the glorious colours of fall. Tucked among these hills are the villages of Minden and Haliburton. Minden was the first settlement and became the county seat in 1874. Through it flows the placid Gull River. Moments from town the gentle water turns into a roaring tumble of rocks and water. In fact, the Minden Wild Water Preserve is a recognised world-class white water facility. Somewhat tamer but equally impressive is the Minden Panoramic Lookout with its stunning views over the town of Minden and the hills beyond: ideal at sunset and in autumn. The Minden County Town Museum, with its authentic log home and the old schoolhouse will transport you back to the "olden days" of country living. Haliburton Village is a lively community built around the shimmering calm of Head Lake with its landscaped park, bandshell, beach, and docks. An old wooden caboose, now the tourist information centre, marks the terminus of the railroad line that ran all the way to Lindsay. Today, the line is a popular walking and bicycling trail. Next to the caboose is the old railway station, now a home for regular art exhibits throughout the summer and fall and appropriately named the Rails End Gallery. The Haliburton Highlands Museum has permanent displays as well as a blacksmith shop and an authentic, furnished log home. The scenic landscape of the Highlands is dotted with numerous and charming little villages and hamlets, each with its own unique bit of history and appeals. You don't want to hurry through any of them. The local Bed & Breakfast Group has created two special packages for travellers who love the fall season. In The Hidden Treasures of Haliburton, local outdoorsman and writer Steve Galea will conduct walks to places seldom seen by outsiders, revealing seasonal wildflowers, tranquil glens, marshes, streams, animal and birdlife in abundant variety. As well as his great knowledge of Highlands' byways, Steve has a delightful sense of humour. So this is one walk on the wild side you won't want to miss. September 25-27 or October 2-4. Hiking and Howling will show you another side of the great outdoors you may never have enjoyed: wolves! Expert biologists will lead hikes through the world-famous Haliburton Forest and Wildlife Reserve providing informative and entertaining commentary along the way. This is the largest private forest reserve in the world: over 50,000 acres maintained in its pristine natural state. 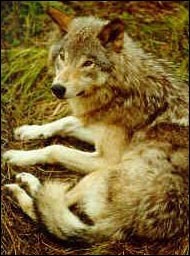 At the Forest Wolf Centre you'll see these legendary animals living healthfully in their own natural habitat. And in the evening you'll take part in a Wolf Howl- it's like nothing else you'll ever experience! September 12-14 or October 12-14. These two packages are exclusive with participating B&Bs. Both include two nights at the B&B of your choice with two breakfasts, lunch on the day of the outing, and a three-course dinner in the evening. Space is limited so book early. 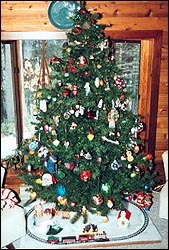 For more information about our fall packages, call any of the B&Bs at http://www.bbcanada.com/associations/haliburton/. And don't miss our B&B Christmas Tour! We love showing people through our homes at any time and, after the success we enjoyed last year, we decided we'd open them again this year. So, on Dec 1 and 2, from 11 a.m. to 5 p.m., ten of our homes will open their doors and invite you in. Five of the homes on this year's tour are new. The B&Bs are decorated in as many different ways as there are B&B hosts, and some will warm you up with tasty tidbits and beverages. Each home has its own distinctive character and the group believes it is this individuality that makes staying at B&Bs so attractive. Many of the B&Bs will also feature guest artists who will be displaying and selling their work. For more information, call 1-888-248-2627.